Dibromotyrosine is a relatively new biomarker that is indicative of oxidative stress mediated protein augmentation. 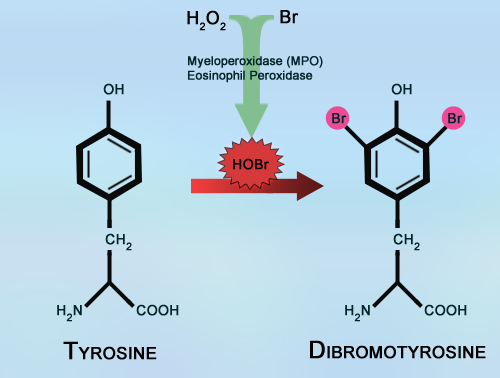 The resultant biomarker is formed when myeloperoxidase (MPO) from neutrophils and eosinophil peroxidase (EPO) from eosinophils act to catalyze the formation of hypobromous acid (HOBr) from hydrogen peroxide (H2O2) and Bromide (BR-) ion. The resulting HOBr results in Br substitutions at the 3 and 5 positions of tyrosine. Wedes SH et al Urinary Bromotyrosine Measures Asthma Control and Predicts Asthma Exacerbations in Children. Journal of Pediatrics, 2011 159(2):248-55. Wu, W et al, 3-Bromotyrosine and 3,5-dibromotyrosine are major products of protein oxidation by eosinophil peroxidase: potential markers for eosinophil-dependent tissue injury in vivo. Biochemistry, 1999 Mar 23;38(12):3538-48. Hazen, S et al Diagnostic methods for asthma. US 20050142626 A1, Patent filing. Montecucco, F et al, Inhibition of Nicotinamide Phosphoribosyltransferase Reduces Neutrophil-Mediated Injury in Myocardial Infarction, Antioxidants & Redox Signaling. 2013 18(6): 630–641. Copin, JC et al, Treatment with Evasin-3 Reduces Atherosclerotic Vulnerability for Ischemic Stroke, but Not Brain Injury in Mice. Journal of Cerebral Blood Flow & Metabolism April 2013 33(4) 490-498.